The impact of technology is obviously perceptible on quality of life in different communities. As they are equipped to keep pace with advances in science and technology, a radical change is occurring in their way of life. Thus, a space to accommodate a wide range of activities must be designed to meet the needs of people. The exponential growth in scientific and technological advancements and the changes in their related needs might not keep up with currently permanent residential spaces. It could gradually hinder the efforts to create a favorable environment and to derive satisfaction. Hence, spatial phenomena necessitate adaptive architectural design to achieve a suitable model for responding to the needs of human societies, especially in residential areas. The space should be held accountable in accord with the demands of users. This important issue is detectable after spending long hours of activity and attending noisy and crowded spaces. Thus, people require places that psychologically bring them peace and tranquility. Spaces that are subject to adapt to the changeable psychological, cultural, and geographic conditions can provide consumers higher quality. This process leads to a sense of belonging to such kind of spaces among more users. Providing people the varied landscape to the exterior would refresh them during tiredness of daily activities, furthermore, such observations can maintain their relationship with outer space in one way or another. As a result, the residential environment should be diversifying and open to change based on individuals’ demands. Flexible architectural systems can promote a sense of satisfaction along with vitality and effectively recharge people to work the next day. Scholarly attention has been focused on the importance of human and his mental-physical needs. These human activities aim at reaching a certain goal in terms of peace, happiness, and satisfaction in worldly life. Using a system that changes its comportment in response to user’s demand in residential areas has a direct impact on stages of human life. By space change based on user’s need, he or she can increase the happiness of being in that space. Regarding the feeling of happiness, the results of this research could have an impact not only on each house but also on society. Using correlational method, interviews were conducted in this field study. Now that technology has had a significant influence on the formation of human needs, the current status of buildings with regard to change requests cannot be maintained any more. As a result, this study adopted the effective strategies to create flexible spaces for residential buildings and private residences. Abbasian, Ghazaleh, Mohammadmehdi Moulaii, and Seyyed Aliakbar Sadri. "The Use of Flexible Structures in Tehran Residential Spaces to Respond Better to the Changing Needs of Its Residents." American Journal of Energy Research 5.1 (2017): 1-11. Abbasian, G. , Moulaii, M. , & Sadri, S. A. (2017). The Use of Flexible Structures in Tehran Residential Spaces to Respond Better to the Changing Needs of Its Residents. American Journal of Energy Research, 5(1), 1-11. Abbasian, Ghazaleh, Mohammadmehdi Moulaii, and Seyyed Aliakbar Sadri. "The Use of Flexible Structures in Tehran Residential Spaces to Respond Better to the Changing Needs of Its Residents." American Journal of Energy Research 5, no. 1 (2017): 1-11. By settlement, human being comes into being and in what manner or way he lives determines who he is. Due to the low grade changes in the pre-industrial world, human beings made their settlements last forever during those years. The changes caused by the Industrial Revolution have highlighted the rapid growth being experienced across much of the world in a way that the pace of life is growing faster every day. Therefore another type of being has been created by human beings. Human was inspired by nature when he began building. In response to environmental changes or human beings’ special needs, one of the unique features of existing structures in nature is activated by opening and closing their components . By looking back and reflecting on how life was in the past, one can understand that individuals have always matched their situations with their needs. The initial construction of shelters for protection against atmospheric agents or the kind of lifestyle which was dominant among tribes and small communities to secure themselves against predatory animals or other tribes’ attacks could be mentioned as some examples. It can also be seen in the life of nomads. Their tents are movable structures which can be folded into smaller shapes and shipped to other locations . In fact, the concept of flexibility is not new and high quality traditional houses in all countries, including Iran, has long been built by this impression . Heidegger, the German philosopher, complained that the German word “Bauen”, which is related to building and construction in these days, does not imply the deep meaning of “residing” any more. According to him, what settlement means nowadays is just as an indicant of human behavior among a variety of other behaviors and residing solely means “ownership of a house” nowadays . Thus, to restore the true meaning of residing and to improve its quality, the term “ownership of a house” can also contain architectural form. Adaptive architecture, with its growing and dynamic forms, shows the characteristics of space-time dependence of an organic world . In general, consumers are urging to make changes and such demands are also introduced by environment, the new rules, style, etc… As a result, buildings should be adapted continuously to the technological systems in order to be able to deal with different situations . Reasonably, after considering the spatial dynamics and having a deep understanding of the term residing, we need a place which is very different from current situations and getting access to it will ensure the satisfaction of the space. Changes in the family system or individuals would result in changing the functional needs at home in the past and using the concept of flexibility responded to these changes. When putting into operation and while in the condition of functioning, a house witnessed many changes in the number of family members. To live alongside other family members, a space had to be considered for their married children. Some older people also lived with their children. There was a decline in the number of people in the absence of family members who were separated again from their family. Consequently, the space adapted itself to the new conditions. They were able to overcome this condition after only through the use of adaptive space. (Figure 1). We naturally tend to make our surrounding environment to be more convenient for our business activities as well as leisure time in order to enjoy the privacy better. In fact, people prefer to replace impersonal and unknown environment with personal atmosphere . As a result, a sense of belonging to the space increases and it raises the space efficiency. The need to provide appropriate space, belonging to the space, and comfort in it have been remained the same in the past and present circumstances. However, additional factors such as mechanical life, the speed of technological development, and unpredictable climate changes are effective factors on the spaces. It is thus that the concept of flexible spaces in our residential should put out to interest. As a result, more diverse and variable demands are taken into account. Various studies have been done to improve the efficiency of flexible structural systems which can facilitate flexibility in designing buildings. And efforts to increase the accountability of architecture can make any physical change adapted to the needs and circumstances . Thus, improving the quality of life status is the aim of this study. The technology can be seen in all aspects of human life drastically nowadays. The world of communications, high-speed transport systems and the use of advanced science accelerate the process of people’s daily activities. These lead to dramatic changes in their lifestyle. Likewise the speed of development of these technologies increases the rate of transition in everyday life making users’ demand in different spaces be changed. On the other hand, because of the environmental and climatic changes in the current conditions, maintaining appropriate temperature and comfort for a long time is difficult for humans. Significant occurrences such as environmental pollution, global warming and the use of fossil fuels cause climate change. These factors consequently make human beings adapt themselves to such alteration in order to maintain comfort and respond to their needs and wants in life in one way or another. All the aforementioned factors and also the other ones involved in them made us respond to the needs of the present situation. Assuredly, the current buildings with static architectural spaces which their components cannot be changed are not appropriate for users who constantly meet their needs on the basis of external factors. As a result, methods that are in line with the growth of changes should be presented and they have to maintain their effectiveness in the long-term period. Human being has always tried to relatively adapt himself to the standards of technology in the society which he lives in. Consequently, he has benefited from many advantages of new technologies. However, they sometimes diminish human relations. Relative satisfaction among people depends on the way their needs are met. Using adaptive structures in residential areas and creating flexible architectural space not only make families tend to spend more time together but also increase happiness among family members by changing the spatial quality. The main purpose in applying the concept of flexible architectural space is to meet the needs of users, depending on the various internal and external factors of each variable. 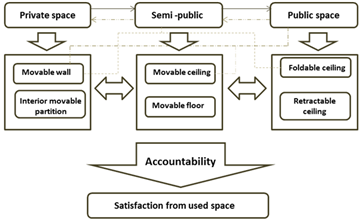 According to Figure 2 and by identifying common needs and shared demands among people and applying different concepts of flexibility, a wide variety of spaces can be attained so that both user’s demand and space satisfaction would be guaranteed. On the whole, the researcher tried to apply a technology with movable structures in housing to create flexibility and mobility for the intended spaces of users based on their need to make the most of them. Moreover, the coordination of internal environment with individuals’ morale at different times increases space satisfaction as well as the sense of belonging to that place. As a result, the time that individuals spend together would have higher quality and they would be happier. 1. How adaptive structures can have a beneficial use to the needs of users? 2. Is there any relationship between the mobility of structures and spatial satisfaction? 3. What is the relationship between the flexible architectural structure and the sense of happiness? 1. It is assumed that some measures can be taken in spaces that are not normally used in order to meet the needs of users in a required situation. For example, terrace cannot put into service for a specific purpose, in case it rains or the sun shines brightly. 2. It seems that people are satisfied with a space when it is dependant to current situations and can act in accordance with the needs of individuals. Selecting movable structures conforming to the space needs can promote satisfaction from that place. 3. It is assumed that whatever the space is consistent with the wishes of the people, they will have better feelings in that place and it affects their lives in a way that they will attain better mood and behavior and also will be happy by being together. The idea of adaptable design as part of modern movement was introduced by architects such as Le Corbusier, Mies Van der Rohe and then by Habrakin and Horst Berger, from the beginning of the 20th century. This idea was the result of developments in technology that made it possible to separate static structures of a building from its elements . Le Corbusier constructed the Domino house based on the adaptable design in 1914. It only included plates to use in floor and ceiling and columns to resist loads of planes. The interior walls played merely the role of partitioning and separating spaces . Haberman was one of those who played a significant role on movable structures, or deformation. He is better known for Iris Dome which was installed alongside the German Pavilion in 2000.Using retractable structures, like eyes that can open and close, the perimeter of the Dome remains constant when opening and closing happens . Flexible design is one of the key concepts in social-spatial elements of Iranian traditional architecture. Showing life conformity with the surroundings, it can be adapted for the seasonal changes in the central courtyard of the house. In fact, climatic and environmental requirements and making the best of natural resources in residential areas compel people to change the spaces . Michael Fox defined the flexible architectural design in 2000. He mentioned buildings with variable and movable positions along with the geometry of space which was subject to change . Such an attitude towards residential areas can be important for us at this very instant. Since there are unused spaces in houses during different seasons due to temperature conditions, movable structures can amend the situation in these components. They also increase the possible presence of people in these areas. As a result, maximum advantage of all parts of the house has been taken, meaning that people have gotten a sense of satisfaction from their residential space. Our focus is on extending the feasibility of the flexible design in civil engineering . In fact, we applied the adaptability in residential areas as a solution which enables us to be responsive to a diverse range of changes in different situations. Different definitions could be offered as flexible housing due to the intervention that can be done within or outside a residential house and the changes that can be given at every single detail or in grand total of the architecture. But flexible housing in a general definition is a house that actually responds to all the needs of its residents. Also, it has a potential to respond to future needs which sometimes is unpredictable. The rate of flexibility will be different on account of different potentials and solutions in a residential unit for including the needs and wishes of current and future residents of a house. 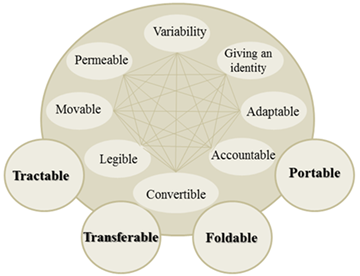 Two different concepts can be detectable regarding flexible housing design and incorrectly they are used interchangeably at times: “Convertibility” and “Adaptability”. The difference between these two concepts is the changes that people can pose in the space where they live. There are small interventions that can go a little beyond the replacement of furniture in an adaptable house. But a convertible house can accept interventions by creating significant changes . Flexibility refers to the ability of a change in objects in general. In architecture and environmental design and housing construction sector in particular, the term “flexibility” is considered as space flexibility and organizing man-made spaces and making changes to achieve the required situations, needs, and new practices . In fact, providing the potentiality of change, the adaptability of spaces to the demands, and the quality of changing spaces of living according to personal desire are important characteristics of an ideal home . In another definition, flexibility is as a means of providing the least possible offer for housing so that the opportunity for personal choices to be created . The basis of flexible structure involves a wide range of structures that can be developed and assembled with all speed. Combining the convertibility of design in construction of temporary structures can greatly improve the possibility of reusing and reconfiguring them. In addition, such procedure reduces the time of installation which results in better performance to achieve short-term solutions and vital needs . Based on the definitions of flexibility mentioned above, an important principle is to pay attention to users’ needs in time. To fulfill such demands, the flexibility should be utilized in a short period of time. In the absence of flexibility, either these demands are not met or a lot of time or secondary systems are required in a way that by observing specific needs, the demands of main point may be diminished. It should be noted that the two main obstacles that prevent reflection and implementation of flexible spaces are a requirement for higher initial cost and the reluctance to dispense with less flexible interiors of the past . Given the long-term benefits of flexibility to moderate inner atmosphere, there are some reasons for denying the different barriers to reduce the use of heating and cooling systems so that such process reduces the cost itself during a fixed period. Considering the studies of movable structures and the issue of flexibility, there is special attention to the spaces which accommodate a large number of people in a certain period of time. For example, spaces such as gyms and stadiums are needed in different seasons and different times of the day. Thus, they should be originally planned as flexible structures to maintain comfort so that little dependence on climatic factors and geographical positions to be posed, from functional aspects. Also, it should be noted that the issue of flexibility in housing has been seriously investigated. This flexibility is more focused on architectural design so that the circulation space is accountable for the best performance. Finally, internal partitions have been used for separating different spaces. It all helps the formation of spatial flexibility. In fact, most of the people are enclosed in their spaces regarding each unit. Although flexibility provides a little comfort for users here, the connection of people with the outside world will be cut off, by paying too attention to interior. As a result, people resorts to a state of seclusion. This study went a little beyond the concept of flexibility and tried to suggest a system that perpetuates the continuity of interior and exterior. In fact, using the technology of movable structures makes families pay attention to not only interior part of the building but also to the continuity of semi-open spaces which should be preserved. Thus, the families can enjoy from some parts of the building which had been practically useless before, due to various factors such as overhanging, rain, and the sun. Regarding flexibility, a target population which consisted of four groups was surveyed in order to assess the qualitative indices. Each group itself was comprised of middle-aged people, women and men, as well as children who were selected randomly. To become familiar with the topics of the study, the participants were given explanation. Necessary steps were taken to answer the questions. The results are as follows. The participants were asked about their tendency for static or dynamic spaces in the first stage. 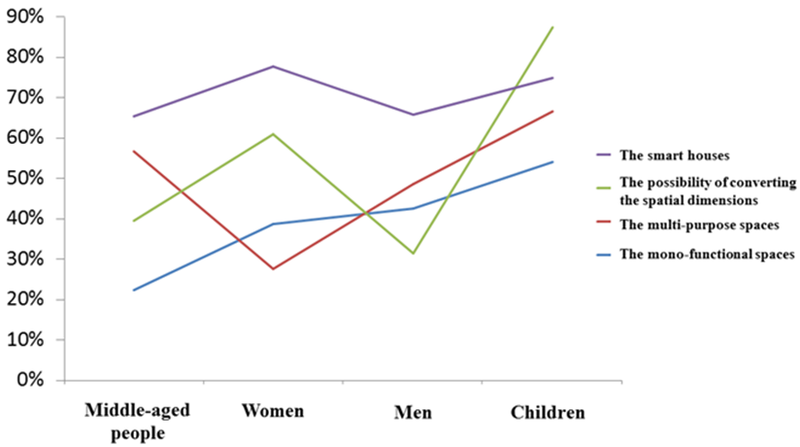 According to the results, all groups have more tendencies towards the dynamic spaces than the static ones. According to the results of the Figure 4, younger people as children in families were more willing to experience new conditions among these groups, though all groups had a tendency towards changing of living spaces. Besides, younger people were more familiar with technology and it was most welcomed to join them giving various forms in their living spaces. Next, there were women who had an inclination towards the variable factor by which they could manage the entire household, particularly in a current situation that houses are smaller than in the past. According to the results, we found that most of the women were interested in the flexibility of spaces and the movable ceilings in particular. It is obvious that women spend more time at home than other people. Being responsible as mothers and directors of the home, they prefer movable spaces. 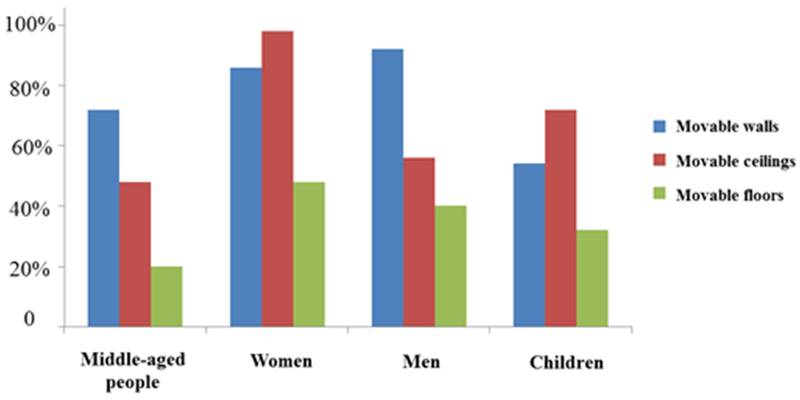 The results of Figure 5 show that the men did not incline towards movable ceilings in comparison to the women. The men believed that movable walls were an effective factor in providing flexibility instead. Correct functioning of movable ceilings and maintenance costs were the major worries for the men and these were the reasons for and against those two inclinations. Hence, movable walls were less sources of worry than movable ceilings for the men. Yet, the factor of movable floor comparing the other two factors was not the priority of the groups among the cases that were surveyed. 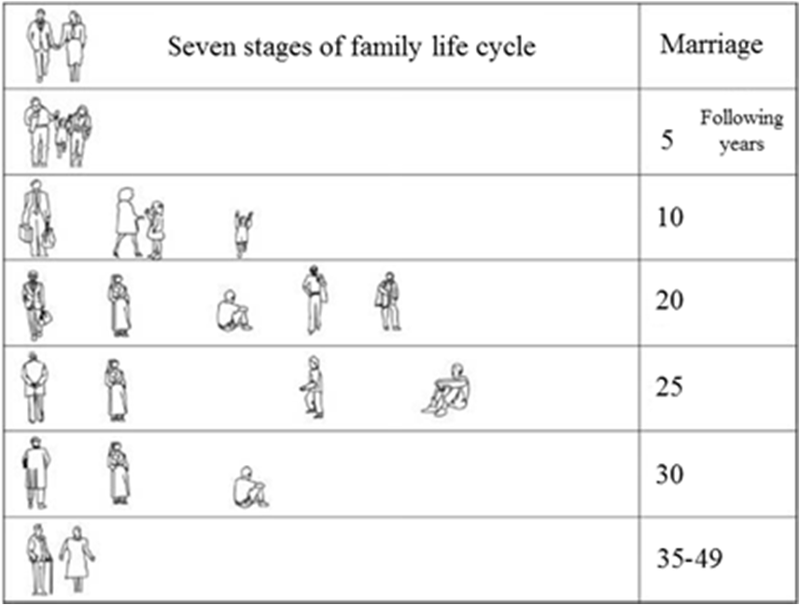 The results of this table indicate that women and men preferred the foldable structures at the greater extent and interior partitions were used for creating a variety of functions. Middle-aged people perceived the importance of transferring a space into a multi-purpose one, due to the fact that they had had the experience of living with several family members in the same house in the past. In addition, since foldable structures have dynamic and appealing forms, they are more compatible with young people who seek diversity and have passionate spirit. What can be inferred from Figure 6 is that the criteria of selecting options, available to the individuals, were the level of their previous acquaintance with these cases along with the way they were used. Internal partitions were obviously more tangible for individuals. Also, people had a better understanding of the existence of a foldable structure compared with a retractable one and this affected their accountability. 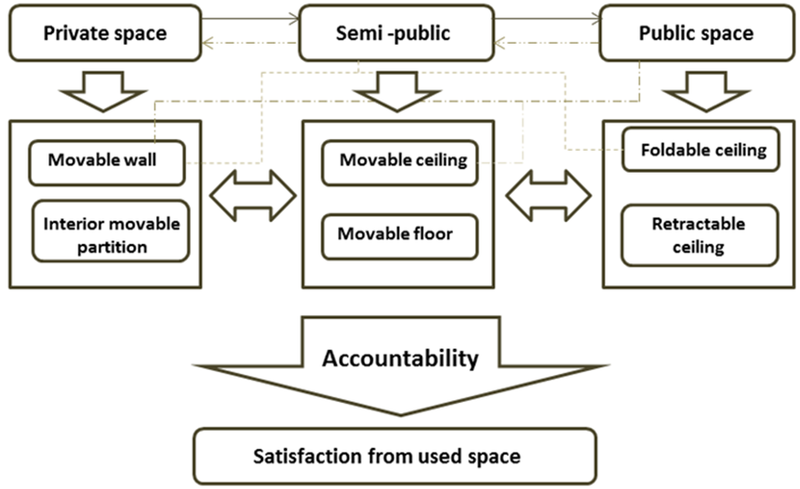 Based on these results, it is easily perceived that middle-aged people preferred multipurpose spaces; women liked more the changeability of spatial dimensions and men were interested in functional spaces and access to several functions of a space. 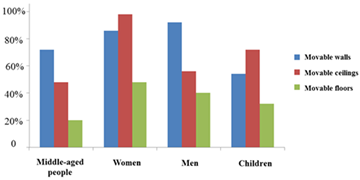 Also, children selected flexible structure more desirable. Despite different opinions and various expectations of each group from a residential space, it should be noted that a bio-intelligent environment attracted most of the people. 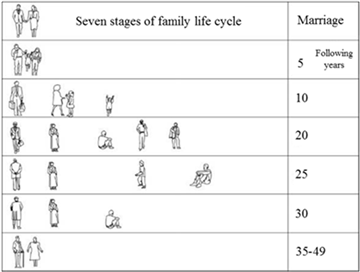 Figure 7 indicates that despite the different choices that each of the groups had due to age, gender and other biological factors, different demands and also the necessity to respond to them were extremely significant. As a result, every individual seemed to credit with veracity that there must be flexible and smart spaces in order to meet all his needs. • Maintaining the privacy of spaces with regard to functional integration. Despite the accumulative number of instances, adaptable designing is still relatively unusual in architecture and in construction systems engineering . As stated by different specialists such as Le Corbusier, concentration on the issue of flexibility and the principles about residential spaces would reveal the importance of these techniques. They are applied in a case that the entire structure is static, giving only the choice of locating the interior spaces for specific performances. Therefore, the affordable flexibility was considered to satisfy short term demands of users in this study so that the main purpose which is satisfaction from the intended space would be achieved. Thus, the concept of flexibility is not accomplished via preserving the static structure of the building and then changing the furniture or altering one or more partitions. For example, the effectiveness of the sunshade designing depends on the solar elevation angle and it changes by the cycle of the day and year. So it seems adaptable systems are more appropriate than the constant one. While they can be adjusted to the change of solar radiation, individuals can modify optimal shading and use maximum daylight themselves . As a result, there is a need to create dynamic models that are capable of being adopted in such environments. It is thus that samples used to interact with the consumer should be made according to the equipment suited to the current situation. Thus, they can be adapted properly to the changes of versatile circumstances of consumers . Since coping with the growth of technology has led to the changing needs of individuals and it is extensively affected on the people’s lifestyle, it is logical to use the technology of movable structures in the construction engineering that is in accord with the changing needs of its residents. Obviously, technology impacts on buildings through two different but complementary aspects: it affects both our lifestyle and the way we use the architectural spaces. It refers to adaptation and compatibility of components and it also helps withstand subsequent changes . As a result, both the quality of life and the length of time spent at the residential space will be enhanced desirably. The reasons behind applying temporary and movable architectural are ease of use, retracting, and speed of installation which result in the possibility of deformation and the use of flexible systems . Concentrating on these factors contributes to providing some techniques to change spaces according to the needs of users and exploiting the space optimally. As shown in Figure 8, various solutions can be proposed in order to make different spaces of a house flexible so that each user can change different biological parts of a space based on his desire or mood. Obviously, if there were more private spaces, such as internal ones, then less flexibility would be needed. Furthermore, if there were more public spaces, there would be a vast variety of choices. What is certain is that the psychological characteristics of users and their preferences are unknown for architects. The humanitarian aspects as the main factor in the formation of a space are undetermined for a designer. Since any design should be done to comply with humans’ needs, a technique is required that can offer a solution for this unknown factor to balance this problem of different situations. In this case, it can be argued that the space used for various functions can be effective. As a principle of this study, it can be concluded that there is a direct connection between space users and technology of flexible structures in a desirable residential area and on condition that it happens in a building, a sense of satisfaction of the space would be achieved. 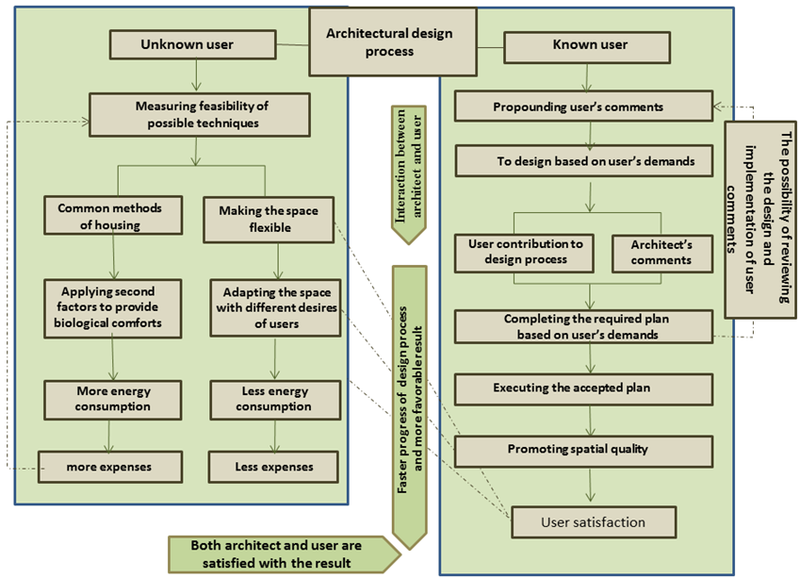 Considering the concept of flexibility in architecture and its application in meeting the needs of any user, the priority of this study was to improve the quality of life. According to the analysis conducted on the target population of the study and by taking into account the factors mentioned above, we obtained some results that can be considered as the significant principles in the flexible designing. • Units over the basement: Apart from the attitude to flexible spaces based on the Domino Le Corbusier’s principles, all substructures can be dedicated to residential spaces in the cases that units are located over the basement. And by using movable floors, the temporary half-open space can be established in the required time. It is necessary to mention that for stability of the floor structure, the secondary movable columns are used. Such columns are embedded in rails on the ground so that they shift their positions. Besides, the rails are protected by rubber bands in order to protect the rails from the accumulation of leaves of trees and blocking the path and so forth. To shape such half-open space, movable walls and sunshade can be effective on the façade likewise. • Units with blocks of terraces: Concerning units with terraces, movable ceilings can be also set up to use these spaces permanently. Such ceilings can be a type of movable sunshade attached to the façade with movable horizontal panel that moves linearly from the interior to the exterior. In this case, suspended ceiling can be used to hide the movable ceiling in the interior space. Furthermore, using movable walls can be productive in establishing the half-open spaces around the terraces which one or both sides are open. • Internal flexibility: Maintaining functional hierarchy and sustaining spatial integration, based on standards of residential spaces accepted by individuals are the steps that must be taken in observing interior flexibility. Removable spacers can be utilized to separate the interior space and make the required changes according to the demands of users. Moreover, in order to prevent damages to interior decoration, depending on the type of interior space, these folding partitions can be hidden in a chamber as matter of course. • Movable sunshade: To create private small-scale courtyard in apartments, a specific space in floor elevation must be regarded that is not covered by roof. Hence, movable sunshades should be set up to use this space at all times to fulfill various demands in different situations. These sunshades can be either folding or moving on the façade. Also, the retractable fabric structures can be effective in modulating the desired space. • Space on the roof: One of the subjects being considered in the static architecture is the use of green roof. This sort of spaces was used in another way among many families in the past. Green roofs can bring all the benefits to the building and its surrounding environment if they result in making optimal use of a space for individuals. Column-like spaces within the specified range for arranging foldable partitions, movable or retractable roofs, and movable tent structures can perform any type of function for outdoor, semi-outdoor and even indoor spaces for short term needs. Here, the most important issues are the value of users’ demands and striving for satisfying them, and using the technology of manufacturing. To achieve these goals, flexible structural engineering should be used in residential areas. 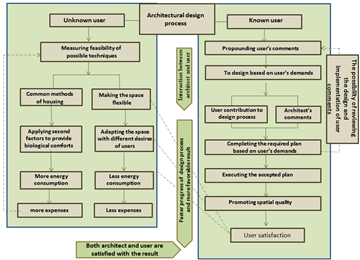 Finally, complying with diverse users’ needs has contributed to user’s satisfaction and happiness along with promoting spatial quality in architecture, which were the aim of this study. According to Figure 10, various ways can be considered to create flexibility in a residential environment generally. Private, semi-public and public spaces in a residential setting can be employed according to the type of plan, its orientation and climate-condition by one or more methods. Considering all of these factors altogether, they can guarantee the spatial utility and the use of all parts of the house in all seasons with acceptable quality level. 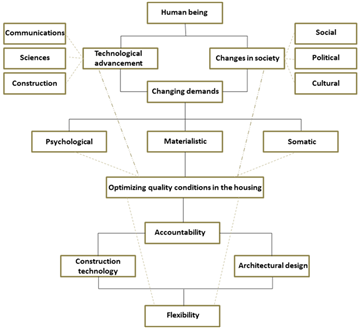 Figure 11 demonstrates that flexibility is a well-founded option which can be accountable for the changing demands of contemporary society in a residential environment. Finally, given that there are some factors affect the architectural space such as consumers’ role, individuals’ noticeable dissimilarities as well as different cultural spaces along with utilizing technology in different spaces lead in enhancing the compatibility with the environment. As a result, it can boost satisfaction and space efficiency (Figure 12). Asefi, M. Foruzandeh, A. “Nature and Kinetic Architecture: The Development of a New Type of Transformable Structure for Temporary Applications”. Journal of Engineering and Architecture, no.6 (2011). Taghizadeh, K. “Application of Structural Systems for Movable and Temporary Shelters” Jahan, No. 3 (2012) p. 2. Einifar, Ali Reza. 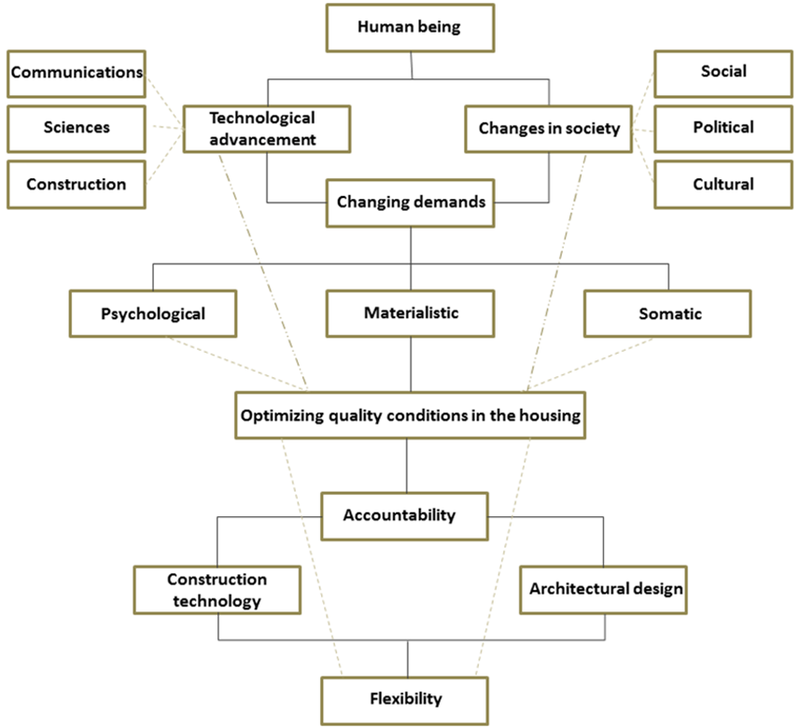 “A model for analysis of flexibility in the traditional housing in Iran”. Honarhay-e Ziba, No. 13 (2003). Abbasian, Ghazaleh. “Flexible Structure, The Essential Quality of a Convenient Residential Buildings”. Master’s thesis, Technology in Architecture, Tehran University (2009) pp. 17-24. 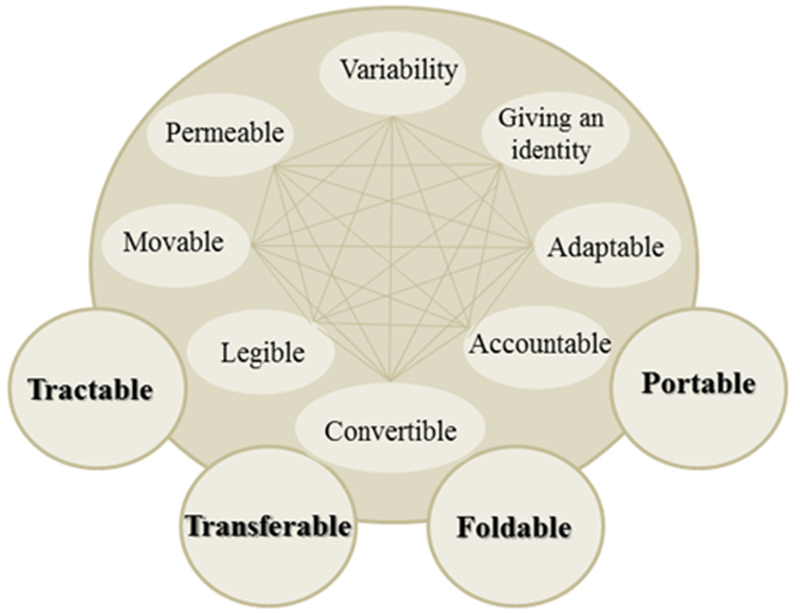 Chilton, J., Rodriguez, C. “Transformable & Transportable Architecture with Scissor Structures”, Transportable Environment III, Abingdon: Taylor & Francis, (2006). Nakib, Faiza. 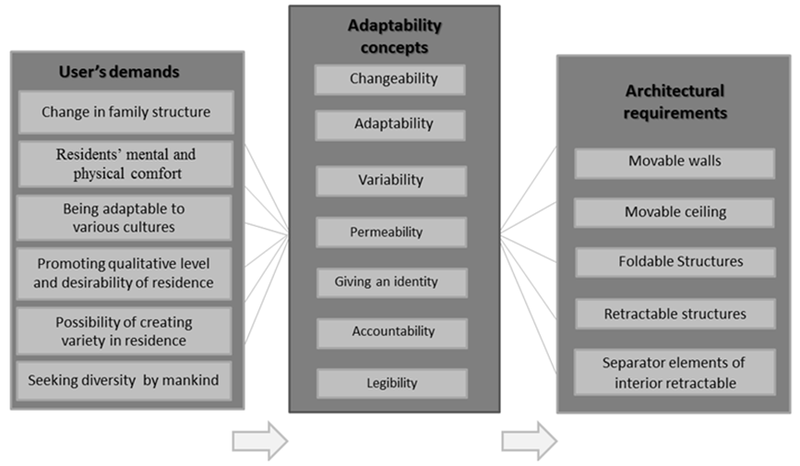 “Technological Adaptability, an Approach Toward A Flexible and Sustainable Architecture”, Conference On Technology & Sustainability in the Built Environmen, (2010). Mowatt, Kevin. J. “Adaptive housing”, Art and historic preservation, Roger Williams University. (2007). Piva, Stefano and others, eds. “A Flexible Architecture for Ambient Intelligence Systems Supporting Adaptive Multimodal Interaction with Users”. IOS Press, http://www.ambientintelligence.org (2005). Kirkegaard, Poul Henning and Parigi, Dario, “On Control Strategies for Responsive Architectural Structures”. IASS-APCS, The International Association for Shell and Spacial Structures, (2012). Loonen, R.C.G.M. and others, “Design for façade adaptability – Towards a unified and systematic characterization”. Proceedings of the 10th Conference on Advanced Building Skins, (2015). Eqbali, Rahman. “Modular and Pre-fabricated Approach in Flexible Housing”. Maskan va Mohit-e Rousta, No. 143 (2013). Afhami, Reza. “Aesthetics in Flexible Spaces”. Honar, No. 173 (2012), p. 4. Friedman, Noemi, and Gyorgy Farkas. “Roof Structures in Motion”, Concrete Structures, (2011). Fox, M. “Flexible: Architecture that Responds to Change”, Laurence King Publishers, (2007). Fox, Michael A. and Yeh, Bryant P. “Intelligent Kinetic systems”. MIT Kinetic design group, USA, (1999). Rabeneck Andrew., Sheppard, David., & Town,. , Peter.. Housing Flexibility? Architectural Design, 43, (1973): 698-727. Brancart, Stijn, and De Laet, Lars, and De Temmerman, Niels, “Deployable textile hybrid structures: design and modelling ofkinetic membrane-restrained bending-active structures”. International Symposium on Novel Structural Skins, 155 (2016) 195-204. Greden, Lara V., “Flexibility in buiding design: a real options approach and valuation methodology to address risk”. Ph.d. diss., Massachusetts Institute of Technology. 2005. p. 31-32. Barozzi, Marta and others, “The sustainability of adaptive envelopes: developments of kinetic architecture”. International Symposium on “Novel Structural Skins: Improving sustainability and efficiency through new structural textile materials and designs”, 155 (2016) 275-284. Ismail, Imen and Moussa, Faouzi, “A PERVASIVE SYSTEM ARCHITECTURE FOR SMART ENVIRONMENTS”. I nternational Journal of Artificial Intelligence & Applications (IJAIA), Vol.3, No.5, September 2012. Brancart, S. and De Laet, L. and De Temmerman, N. “Transformable bending-active structures: Manipulating elastic deformation in kinetic and rapidly assembled structure”. Structures and Architecture – Cruz (Ed), Taylor & Francis Group, London, 2016.